EDINBURGH, Scotland, 2017-Jun-15 — /Travel PR News/ —Glasgow Airport has become the first airport in Scotland to boast a coveted food and drink standards award – its Scotland & Sea Food Court has won a Taste Our Best award. The Quality Assurance accreditation from VisitScotland certifies the excellence and provenance of the food and drink available at Scotland & Sea’s airport eateries. Taste Our Best, a joint initiative between VisitScotland and the Scottish Government, is designed to recognise businesses – including hotels, restaurants, cafes, takeaways, visitor attractions and B&Bs – that not only offer a quality food and drink experience but also include and promote Scottish produce on their menus, giving consumers more choice and an authentic experience. The scheme provides businesses with an assessment by qualified assessors of their food provision and menu, with those meeting the necessary criteria receiving the Taste Our Best accreditation.The award provides consumers with an independent and trusted assurance of standards and in addition, offers businesses a valuable marketing tool. Scotland & Sea comprises four outlets providing different catering offerings, with dishes freshly prepared and cooked on the premises.The separate sports bar and grill, deli, buffet-style restaurant and café bar offer a wide variety of dining options, from grab and go light bites to lunch. The Food Court is operated by global catering specialist Delaware North, which invested over £2m five years ago to transform the Glasgow Airport Food Court into a stylish, contemporary and comfortable dining hall. Paula McGee of Delaware North said: “Our priority is to provide our customers with a great, relaxed dining experience, enjoying food of the highest standards – and using quality produce is key to that.Scotland is very fortunate to have superb produce so it’s important to make the most of those rich resources and to be able to give our Scotland & Sea customers a real taste of Scotland. “Our efforts to ensure we do that have been well supported by our suppliers – Bidvest Foodservice, Campbells Prime Meat and McGhee’s Bakery – who appreciate the impact of carefully considering the seasonality and provenance of produce. We are indebted to them, and to the hard work and dedication of all of the staff at our Scotland & Sea outlets, in helping us achieve our Taste Our Best award. Denise Gilmour, Head of Retail at Glasgow Airport,said: “We are thrilled to receive this award, and to be the first airport in Scotland to gain ‘Taste Our Best’ accreditation is a wonderful achievement for all of the people who work tremendously hard each day to provide a fantastic variety of catering options for our passengers and colleagues. “The Delaware North team at the airport has put in an incredible amount of effort to ensure Scotland & Sea meets the standards required to not only provide a first-class experience, but that the Scotland and Sea menu highlights the very best produce out country has to offer. Liz Buchanan MBE, VisitScotland Regional Partnerships Director, said: “My congratulations go to Scotland & Sea on winning this important Quality Assurance accolade. This is great news too for Glasgow Airport which is already well-known for its commitment to giving all of its customers and millions of visitors to Scotland, the warmest of welcomes as well as excellent hospitality. Around 58% of all visitors to Scotland and 71% of overseas visitors to our country eat in a pub or bar, whilst almost half (49%) of all visitors want to try local food – giving hospitality businesses an ideal opportunity to capitalise on the increasing interest in the nation’s natural larder. Research has shown that visitors are willing to pay up to 15% more for food that is of Scottish or regional origin, and businesses which provide and promote their use of local produce can typically enjoy higher level sales of up to 20% per year, providing a real financial incentive for businesses to sign up to the accreditation scheme. It is estimated that tourism’s contribution to Scotland’s food and drink industry is worth £2.5 million per day to country’s economy, with sampling traditional dishes and local produce among the top activities undertaken by visitors to Scotland. 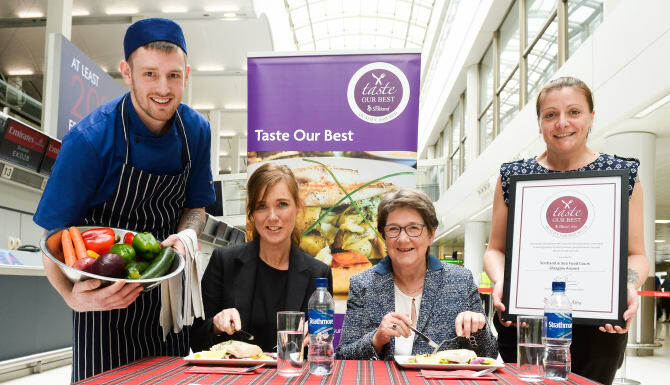 This entry was posted in Airports, Business, Food & Drinks, Tourism, Travel, Travel Awards, Travel Management, Travelers and tagged Denise Gilmour, Glasgow Airport's, Liz Buchanan MBE, Paula McGee, Scotland & Sea Food Court, Taste Our Best award, wins. Bookmark the permalink.